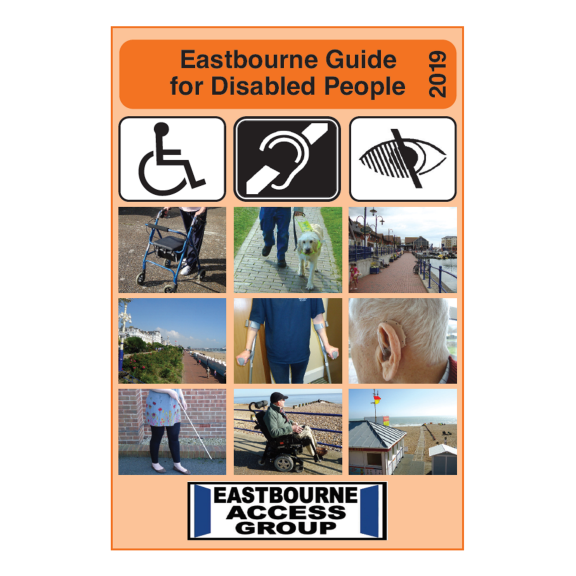 The new 2019 Eastbourne Guide for Disabled People is now available from the Tourist Information Centre in Cornfield Road and seafront office, No. 1 Grove Road and the Town Hall. Soon to be distributed free of charge to hotels, mobility shops, libraries, Shopmobility and a host of other outlets, the new guide has more information about accessibility issues that affect all people with mobility or sensory impairment. The guide is a conveniently sized booklet containing key elements of the Eastbourne Access Group's website www.eastbourneaccessgroup.org.uk that delivers comprehensive information about accessible facilities and services available in Eastbourne. Places to visit, eat, stay and entertainment venues are shown on the website together with facilities available to disabled people. Wheelchair route maps show safe places to cross roads with wheelchairs, mobility scooters and other wheeled mobility aids. As well as being invaluable to disabled people whether they be residents or just simply visiting the town, the new guide will be of great use to older people with age-related impairment and others for whom everyday life presents many obstacles and barriers. Local travel by bus, train and taxi is featured too along with public car parking facilities and notice of restrictions enforced at different times. At the time of printing the alterations to the town centre’s road layout and parking bays has not been finalised so variations to routes may be encountered. We will endeavour to display finalised routes and parking places on our website www.eastbourneaccessgroup.org.uk when known.